I don’t talk about myself much publicly for a number of reasons. Mostly I think people aren’t interested and I really don’t want to bog them down with the things I deal with on a daily basis unless it affects my work. I like to keep myself distant, I guess, but I do have issues and things that are important to me. A lot of time I try to stay out of the conversations though because… honestly, I don’t really feel like I belong a lot of the time. But, this year I decided I wanted to do something for Pride Month, to kind of establish myself and throw myself out there as a kind of declaration. Not really to anyone in particular, more to myself, I think. I mean, it’s not really a secret to anyone who knows me, but I think by putting it out front and center, I’d feel better about it. So I wanted to do something simple, not too complicated and not too overworked. 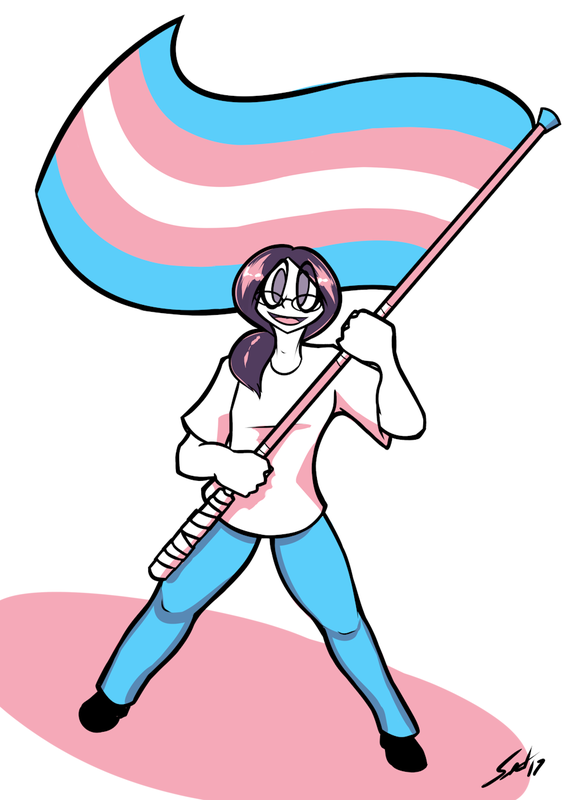 To be honest, I’ve always kind of rolled my eyes at the flags because of how overused they are, but I do like the trans flag a lot for its simplicity and the color scheme. It appeals to me and it’s something that I relate to, despite how much I’d not wanted to years ago. It’s not the only flag/label that applies to me, yeah, but it’s the one I think I get stuck on the hardest, and going forward I want to try and be proud of myself for who I am. I like how you used the flag color scheme for everything. The minimalist in me is giddy. I usually don't do anything for pride, though I'm oddly tempted this year too. Awesome art! :D I usually don't do anything for pride, though I'm oddly tempted this year too. I hope you don't mind But I'd like to use this picture on my social media feed in solidarity with Transgender in light of 'ugh' Trump's despicable announcement. A. The picture is not edited (nothing added, nothing removed) and I'm given credit for the piece (it is a self-portrait after all). C. The use be non-profit (of course). If that's fine, then I'll allow it.